BI Intelligence mobile payments forecast report has been updated to reflect new developments in the market. One of the key takeaways from the report was that by the end of the forecast period in 2019, US in-store mobile payments will reach $808 billion, or about 99% of the old estimate. BI Intelligence's forecast is one of the largest in the industry, and they think mobile payments will catch on faster than other research firms suggest. For more info: http://read.bi/1fkr1d7. 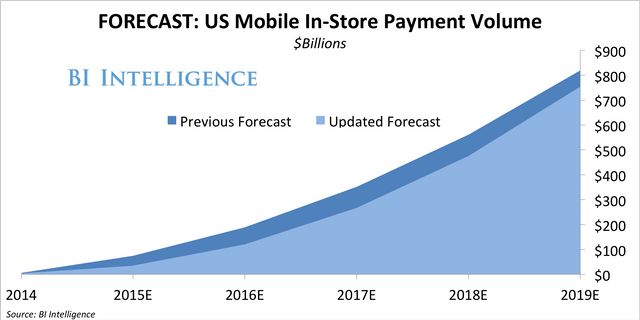 In our latest US in-store mobile payments forecast, we find that mobile payment volume will reach $37 billion this year. This is about half our previous estimate for 2015. The downward revision is primarily the result of later-than-expected launches of major mobile wallets from big tech players.